When we talk about the clip-in hair extensions, we need to start with the reality: they are, by far, the most popular hair extensions. This is because not only they are very easy to install but they are also very easy to remove. 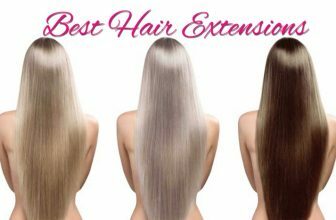 Most clip-in hair extensions reviews tell us how this type of extensions I, in fact, an important step when getting to the next level…the long lux permanent hair and you may get addicted to it, for sure. 0.1 What makes good clip-in hair extensions? 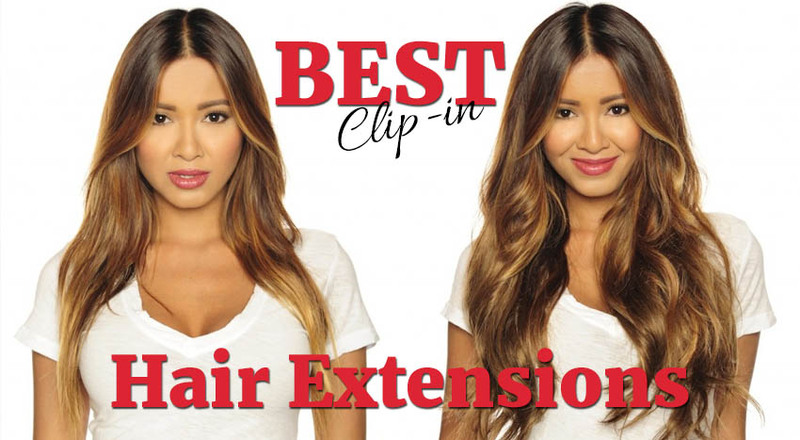 What makes good clip-in hair extensions? This may not seem important to you, but the more your clip-in hair extensions weigh, the more weight they bring to the hair. This actually could bring more damage and risk for hair breakage. Your clip-in hair extensions are measured in grams as the ounces are not enough. It’s always a good thing to know how much weight the hair extensions bring on your natural hair and only the number of hair pieces is not enough information. Best rated clip in hair extensions are in fact reusable and feature at least 2 clips for a secure attachment. Some sets weigh only 100 grams which may not be enough for a full head, in case you are looking for length on your hair. a fun rule on deciding the right weight…the more length you want; the more grams the clip-ins hair extensions need to bring on the…head. Don’t get in the trap of very long hair, if your natural hair doesn’t go below the shoulders. The more length you want, the more extensions you would need and this means only one thing: more money. For the long strands of Ariel, you need somewhere around 250 grams, whereas for 20” length you’re good with 180 grams on the hair extensions. And, when you want only 15” long hair, you can easily do it with 150grams of hair extensions. In the beginning it’s better to play it on the safe side and don’t get too long hair extensions as they bring too much weight on your hair. Take in consideration the pressure on your neck muscles also as they would have to take in all the new weight. It’s better to go slowly on them and give the length bit by bit. Best quality clip in hair extensions reviews recommend an ideal length of 20” for the hair extensions. This length is just about right and is both comfortable for your hair and neck, and pretty fair as price. Another thing to have in mind when shopping is the quality of the hair extensions. 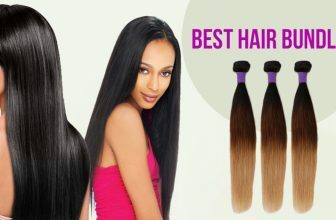 Remy hair is the best choice for the clip-in hair extensions. In the case of Remy hair, all cuticles remain intact and facing in the same direction. Non-Remy hair is acid treated so that the outer cuticles are left out. This type of hair is also silicone treated so it feels softer. Pay attention to the label as there are many clip-in hair extensions that are only 40-60% cuticle intact and this doesn’t bring the highest quality hair. Of course, this type of hair extensions is typically lower priced and you can still use it several times. It’s not long lasting and only the test of time will tell you exactly how much Remy hair there was indeed. Never forget to get a look on the clips themselves. Some are snap-clips and have a silicone lining on the cross-bar. Go for the u-shaped tine and not the straight tines as they hold better the hair extensions. In order to have the best results when using the clip-in hair extensions, there are some steps you need to follow. Try to create a good base for your hair extensions. You need to offer a good grip so that the hair extensions have something to hold onto and don’t slip out. Don’t be afraid to use the heat tools and pave wrapped your hair and the extensions around the flat iron. Use a large-barrel curling iron for the big curls or use the flat iron for a straight, sleek look. Last, but not least, run your fingers through your hair and the extensions so that they all can fall and flow in a natural way. For more volume and definitely more length on your chocolate brown fine strands, give it a go with the 20″ Clip in Hair Extension Human Hair Extensions Clip on for Fine Hair Full Head Chocolate Brown. The hair extensions are about 140grams and feature 22 clips and a pack should be enough for a full head in case your hair is fine. 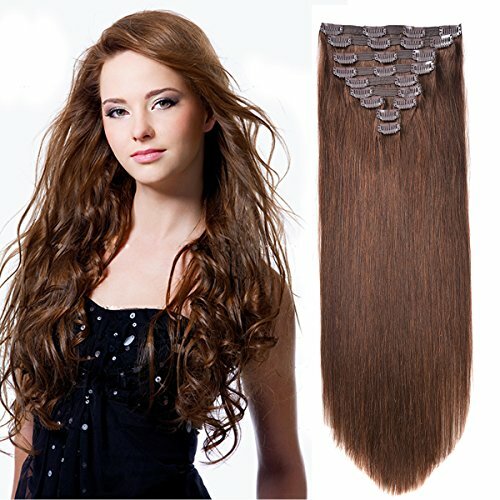 The hair extensions are made with 100% Remy human hair and take the heavy styling for few good years. You can style it just the way you do your natural hair: wash, straighten, curl, wave and so on. The color of the extensions is a beautiful dark brown that combines very nice with many shades of brown. The multi-tonal coloring makes the hair extensions seamless and blend naturally with your own natural hair. Your hair wins great volume and length when using the extensions. The hair extensions are well crafted double wefts and are thick all the way through, up to the ends. The clips are good quality and sewn so that they keep securely the hair extensions. The clips are gentle on your hair and don’t bring much damage. The hair is soft, silky and has a nice luster. As is has already been through some chemical process, it’s better to check with a stylist before color it. Better yet, try on a piece before you do all the hair extensions. All in all, for a very good price you get a nice, durable and natural option to bring volume and length on your brown chocolate thin hair. 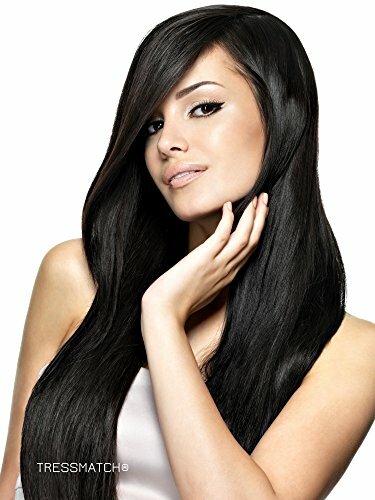 When you want to boost up a bit your black hair, give it a help and more length with the Tressmatch 20″-22″ Remy (Remi) Human Hair Clip in Extensions Off Black. 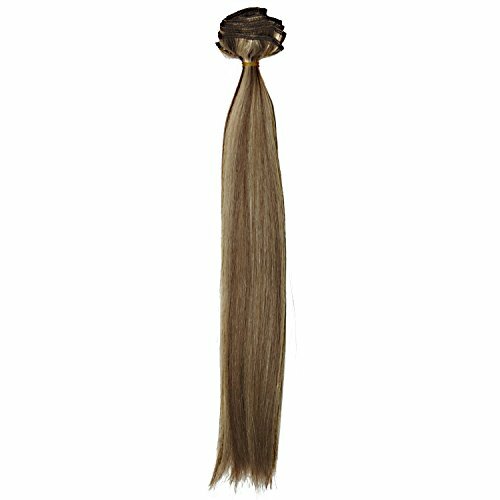 The hair extensions are made with 100% Remy human hair and you may treat it as if it was your own. You can wash/straighten/curl/color the hair extensions just as much and as variously you do it with your own hair. 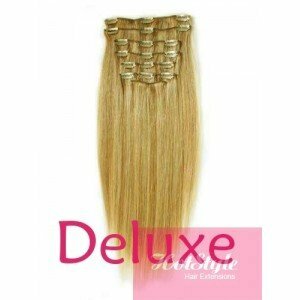 The extensions are well crafted double drawn wefts and are pretty thick from top to end. The clips are sewn tightly and they feel comfortable on your natural hair. The clips are lightweight and keep in place the hair extensions. The hair extensions make a good choice for the thick and medium thick hair. There are 10 wefts in the set with various width and clips to hold them tight on your hair. The hair extensions look very natural and blend smoothly with your natural strands. The hair extensions are full and thick and highly versatile and you may combine them as much as you want. When you take good care of them, you may have them for years. 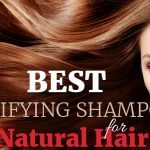 It’s best to use the proper heating tools, dyeing, shampoos and conditioners and care products for colored processed hair. You may re-dye the hair extensions, but it’s better to check with an experienced hair professional before. Despite the small issues, the hair extensions bring volume and length to any black thick hair. Lightweight and blending very well with your natural brown hair, the Clip in Chestnut Brown 18 Inch Human Hair Extensions give your hair length and some volume just as well. The hair extensions are made with 100% Remy natural human hair and they look very natural also. they don’t tangle and the shedding is minimum. The hair extensions are also versatile and may be styled in so many ways. You can wash/curl/wave/straighten the hair extensions. You can even take them when swimming, with no worried about them falling down. The hair extensions are very easy to attach with clips in. the clips are colored in dark brown on the base so they are seamless in your natural chocolate hair. The hair extensions are lightweight and don’t add much weight on your hair. the damage is minimum and you can use the extensions for quite some time. When it comes to the cons, we only mention that the extensions don’t bring very much volume as they are not very thick. But, if you want length, without the extra volume, the hair extensions sure make the cut. Just because you are happy with your red strands, doesn’t necessarily means you can’t spice up the things a little bit more. You can always bring more volume and length with the GoGoDiva Clip in Hair Extensions. Soft, silky and made with 100% Remy human hair, the hair extensions give your strands a bit more volume and length. The hair extensions are handmade which makes the shedding minimum. When it comes to styling, you can get as creative as you like and don’t hesitate to curl/straighten/cut and color and the hair extensions. You can also use the heat styling tools on the hair extensions. You can securely attach the hair extensions with the 18 clips that come along with the 10 wefts. The clips don’t just secure the hair extensions, but they also are very comfortable and gentle on your natural hair. The wefts are very well made and let you find the perfect appearance on your hair. Apart from the small cons, we consider the hair extensions to be a nice, soft and versatile choice to give your strands more volume and length. 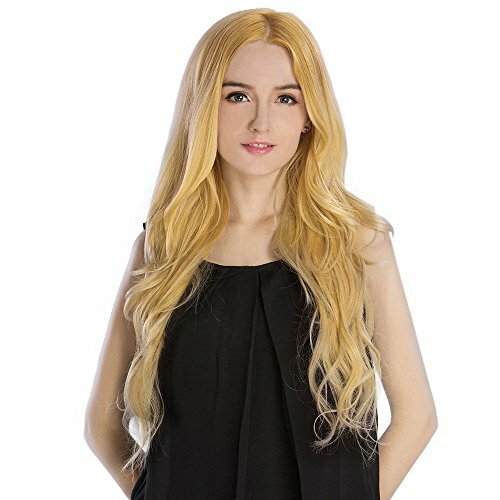 For a beautiful mermaid look, don’t hesitate to try the Hotstyle – 28″ (70cm) Deluxe Clip in Human REMY Hair – Light Blonde / Natural Blonde. Not only the hair extensions give great length on your natural strands, but they also bring a luxurious appearance on your overall look. The hair extensions are made with 100% Remy hair and are silky, soft. The European hair type has a sleek texture and the hair extensions cover your entire head. The hair extensions are very well made and the Remy hair is authentic. The shedding is minimum and the hair extensions don’t tangle either. You get 17 attached metal clips that hold tightly the hair extensions. Even though they are made of metal, the clips are pretty gentle on your head and feel comfortable also. the hair extensions are easy to attach. The professional manual that comes along is very helpful and the more you take good care of the hair extensions, the more you have it around. The hair extensions don’t add much weight on your natural strands and one set is enough to cover your head entirely. There are 16 hair wefts that give a good cover. 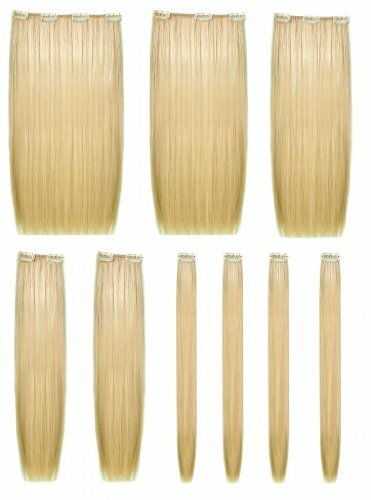 The hair wefts are also very well made and they blend great with your natural blonde hair. When it comes to styling, the hair extensions are great also as you may curl, wash, straighten them as often as you want. And you can also safely use the heat styling tools. Despite the cons, whenever you fall for a mermaid, luxurious look, don’t hesitate to give the hair extensions a try. When you are willing to pay a fair price, but make no compromising when it comes to the quality on your hair extensions, it’s a good idea to try the Tressecret Remy Human Hair Clip-In Seven Piece Extension, Dark Brown Frost. The hair extensions are made with 100% collected Remy human hair and bring to your hair a nice length and a pretty good volume just as well. The hair extensions are versatile and may be styled in many use. you may curl/wave/straighten them and use various thermal styling tools. As a matter of fact, the hair extensions give nice curls and waves and have natural flow and hold the curls very good. 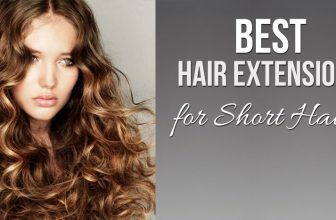 You don’t need to worry that much about your hair being too short for the extensions as they may be attached on hair that is as small as 4inches. The hair extensions are easy to attach with the clips. You get triple weft hair extensions able to cover your entire head with only 7pieces. The ‘U”-shaped weft is kept in place tightly with silicone-based clips. The lace is made of aero-silver and fits nicely on your head. This lace also keeps at distance unpleasant and odor-causing germs. The clips are soft and gentle on your natural hair. They keep in place the extensions also. The hair extensions are light and don’t bring much weight on your natural strands. Their color is nice and combines great with your natural hair. Despite the minor issues, the hair extensions make a great choice and come with a very good price. 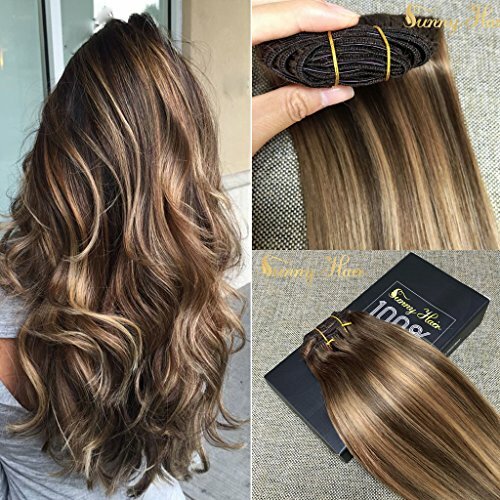 When you want to add some more volume and nice length to your blonde shades but you are very tight on a budget, give it a try with the Sunny Dip and Dye Ombre Clip in Human Hair Extension. The hair extensions are made with Remy human hair and are a pretty good quality. The hair may be styled in many ways and you can wash it, curl it and straighten it just as well. You get a full head set that consists of 7 pieces’ hair wefts with 17 clips to use. The attachment is very easy to do and you get instant volume and more length when using the extensions. The color of the extensions is great and they combine pretty nice with your own natural hair. They have a nice flow and don’t add too much weight. As the hair has already been dyed, it’s better to talk to a professional stylist that may give you the best instructions when it comes to dying. Better yet, you should let him/her dye the hair extensions. The hair extensions have a straight texture and a soft feel. They are silky and complete your natural look. Despite the minor issues, when you’re tight on a budget, the hair extensions make a versatile, pretty nice option. Even if you like your short hair, sometimes you miss the long strands and you don’t really have the patience until it grows back again. The Clip in Dark Blonde Frost 14 Inch Human Hair Extensions are made with 100% Remy human hair and look great with your natural hair. The hair extensions weigh only 70 grams, without the clips. They are lightweight and are enough for a full head. The hair extensions are easy to attach with the clips. The clips are also soft, lightweight and hold in place the hair extensions. 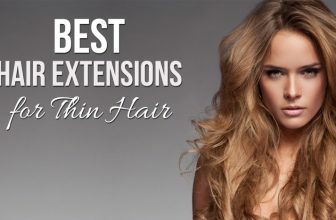 They feel comfortable and make the hair extensions longer lasting. The hair extensions come ready to wear out of the box and this is great. When it comes to styling, you may get very creative with the hair extensions. You may curl/straighten/wave the hair extensions and even use the heat styling tools. As long as you take good care of the hair extensions, you may have it around for quite some time. 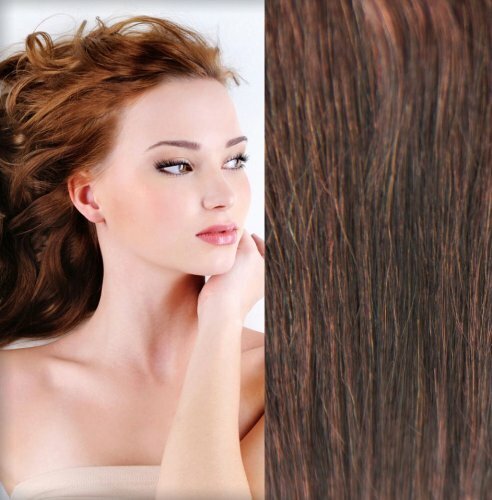 The hair extensions have a nice, natural color that blends very well with many hair colors. As the cons are rather not very important when you see the whole picture, we think the hair extensions make a great choice when you got tired with your short hair. When you get hair extensions made with natural hair, the big advantage is that you can pretty much treat it and style it as if it was your own natural hair, without worrying too much on damaging the hair extensions. It’s the case of the Human Hair 9-Piece Clip-In Extension Set by She by Socapusa – Platinum Blonde that give a great touch to your new hair-style. The set consist of 9 human hair extensions that cover a full head. They come in a nice platinum blonde. The extensions have a great range of lengths, from 18” to 20” so that you can find the perfect combination for a natural overall appearance. The hair extensions are lightweight, considering how many they are. The extensions are easy to attach. The clips are soft, yet very durable and give a tight hold on the natural hair. the wefts are very well made and the clips keep in place the hair extensions. The hair extensions are very well made in Italy. They may be dyed/curled/straighten and styled in so many ways. The straight texture is nice and the hair extensions have a nice flow and make nice curls when in need. With proper care, they may be used for a very long time. Considering the versatility and reliability of the natural hair extensions, we think they are worth of investment anytime. You know that you got yourself some great quality Remy clip in hair extensions when you simply run your fingers through it and… your fingers still come out and run smoothly. The Serica Silky 18″ 100% European Remy Human Hair Clip in Extensions take the test pretty well and they bring not only great length, but also a nice volume to your natural strands. The hair extensions are made with 100% European Human Remy hair and give minimum shedding and tangling. The European is high quality hair that is unprocessed. It’s very soft, has a nice luster and blends great with your natural hair. it simply glows, but there’s nothing fake about its shine. The hair extensions are great when it comes to styling and they take very well dyeing. It’s better though to choose darker shades in order to obtains prettier colors. The hair extensions are lightweight and very easy to attach. The wefts are very well made and may be customized for the best volume on your natural hair. The clips are soft and gentle, yet able to keep tight in place the hair extensions. Even though the set contains only 5 wefts, the hair extensions are enough to give a good volume. With proper care, the hair extensions may hold up even around a year. As for the cons, we only would have liked the extensions to bring more volume. Putting this con aside, we consider the hair extensions to be a great option made with 100% Remy Human hair. There are many brands out there that manage to create and give high quality hair extensions. KINGHAIR manages to create hair extensions with 100% Remy hair, grade quality 5A. you know the hair is natural as it doesn’t shed nor tangles. 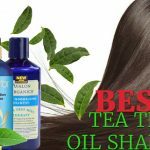 It has a natural flow and combines very well with your own natural strands. 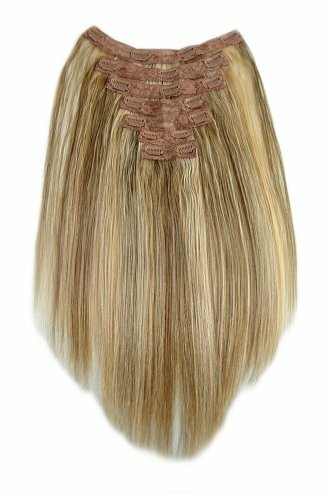 The Strawberry Blonde (#27) Clip in Remy Hair Extensions are a good example for the Kinghair. The hair extensions have a silky appearance and are quite thick. They don’t tangle and the thickness is the same from top to bottom. The hair extensions covet a whole head and considering their length, they don’t add too much weight on your natural hair. They make a perfect choice for the fine, long hair as they bring nice volume, not only length. The hair extensions are double drawn and triple wefted so you can highlight/color/perm/blow-dry/curl and straighten them with minimum risk for damage. They are well made and take the heavy use. The multi-tone adapt coloring system is efficient and the hair extensions combine great with many natural hair colors. The clips hold tight the hair extensions and are gentle for your hair. With proper care, the hair extensions may hold you up to one year. Even though the clip in hair extensions are not the best choice for the thin hair, you can be as gentle as you can and try it for a couple of times. The E-forest hair 8A Grade Virgin make a good choice in this category. The hair extensions are made with 100% Peruvian Human Remy Hair so there is minimum shedding and tangling. The set contains 8 pieces that weigh around 200 grams. the hair is 100% real human hair and has no synthetic nor animal hair in it. The hair looks silky and has a straight texture. There are various sizes on the hair extensions which gives you the freedom to use as many as you want, in the combination you want. You may use them as highlights or to boost up the volume or add more length to your natural strands. You get layered double weft hair extensions that look nice and flow natural. The clips are not only durable but they are also anti-rust. They snap easily, making the attachment so simple. The high quality of the hair extensions is reliable and you may style them in so many ways. As for the cons, we have none so far and we are considering the hair extensions to be a great choice for the thin hair. For a natural appearance on your short hair after attaching the hair extensions, the professional says it’s better not to go with extensions longer than 14” in the beginning. The Beverly Johnson Legendary Clip-In Wavy Natural Hair Extension 14 inches are an option to try as they bring not only a natural flow, but also high quality natural hair in the composition. 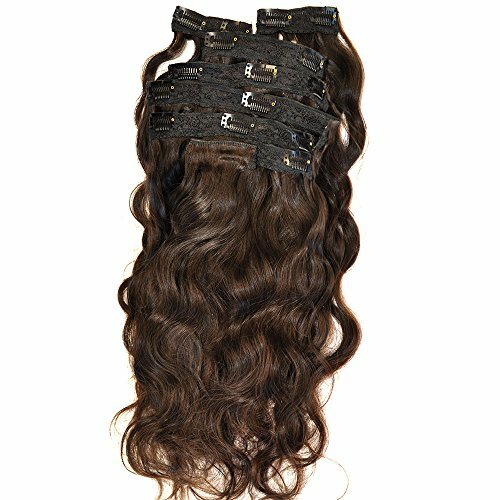 The hair extensions are made with 100% Indian Temple Remy human hair, which means there is minimum shedding and tangling. The hair extensions may come in many styles and colors and you can find your perfect fit. The set consists of 7 pieces that clip in easily. The lengths vary from 3inch to 10 inch and the hair extensions are quite lightweight. The hair extensions have a “lace” backing that ensures an even distribution of the hair. this also brings more volume on your natural strands. The hair extensions have a nice flow. They feel soft, smoot and wavy from root to the ends. They have a natural shine and are quite flexible. You can pretty much the style as you want. You may curl/flat-iron the hair extensions and even color the extensions. All in all, for a good price, you get good quality human hair extensions that give a natural volume and length to the short hair.